I spent part of the holiday weekend at the Northern California CrossFit Regionals, where I saw some of the strongest abs on women that I’ve ever seen! These ladies didn’t have six-packs, they were sporting 12-pack-abs. 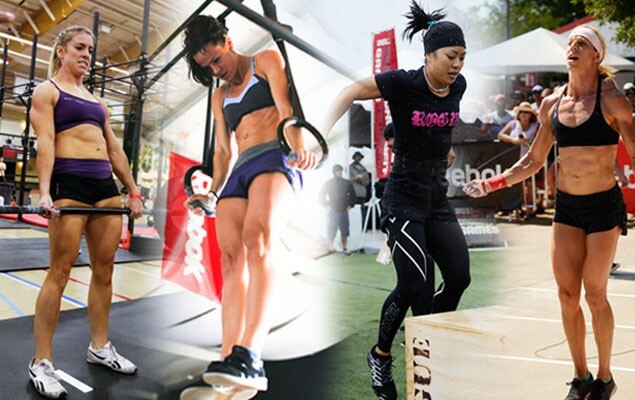 While the strength required to compete in CrossFit means that these women have built some serious muscle mass, the fact that you can see their abdominal muscles means that they don’t have a lot of body fat. That’s because the only way to see your abs is to lower total body fat. That made me think about what CrossFit’s female athletes are doing in the kitchen to develop such lean physiques. Could it be that they’re eating a diet that’s often encouraged by CrossFit that recommends whole foods like lots of veggies, plenty of lean proteins; some fruit and limited amounts of grains, sweets or processed foods? How Low Does My Body Fat Need to Be to See My Abs? As a general rule, most women will find that they won’t see any abdominal definition unless they are less than 18 percent body fat. In fact, some women need to get down to 14-15% body fat or so before they’ll see abdominal definition. For men, ab definition becomes visible at around 10% body fat. All the crunches in the world won’t help you get a washboard, but changes in your diet will. In fact, some new studies show that eating fewer nutrient-poor carbohydrates (read: candy, soda, baked goods) helps target ab fat better than a high-carbohydrate, low-fat diet. Results of a study presented at the Endocrine Society’s annual meeting tested two different diet interventions on adult subjects: 1) a typical US diet (comprised of 55% calories from carbs, 27% fat and 18% protein) and 2) a diet that provided 43% of calories form carbs, 39% from fat and 18% from protein. The diets were matched for each subject’s caloric intake to assure no weight loss during the first phase of the study. In the second phase, each subject’s diet was reduced by 1,000 calories a day and all food was provided during the total duration of the study. The researchers used the most advanced body composition scans, called DEXA, to monitor the total body fat of the subjects before and after each diet trial. Results? After the weight maintenance phase, subjects who consumed the moderately carb-restricted diet had 11 percent less deep belly fat compared to those who at the more traditional carb-rich diet. Other human clinical trials have also found similar results: Diets that are lower in carbohydrates and higher in protein and fat (40% calories from carbs, 30% from fat and 30% from protein) may help reduce visceral belly fat better than typical high-carb diets. Despite all the “Abs Diet” books and special ab-flattening exercises, any diet that promotes weight loss will result in losing belly fat because abdominal fat is readily mobilized when the body needs fuel. The best places to change your diet to reduce ab fat is to eat less added sugars, saturated fats and refined grains—as all are linked with excessive abdominal fat. Eat a diet rich in fruits, veggies, whole grains and get daily physical activity. Abdominal exercises will strengthen your muscles, but won’t do much—if anything—to lose the fat that’s blanketing them. For more about fab abs, read this post.